Perak may be known for its beautiful mountain ranges, valleys to explore and heritage sites but just recently, Perak has become the ideal destination for those looking for a fun-filled gateway surrounded by nature. The Lost World of Tambun is definitely a good place to get lost in. Designed to depict a lost world, the theme park is an ultimate fun paradise for anyone young at heart! The amusement park here features rides and activities that are thrilling and will definitely make your day. Soar and fly high as you let your hair down and enjoy yourself in the speedy rush of the rides here. Tickets are reasonably priced and are definitely worth the money spent because the rides here are definitely fun! If you are up to getting into the water, the water park here is all set to accommodate you. 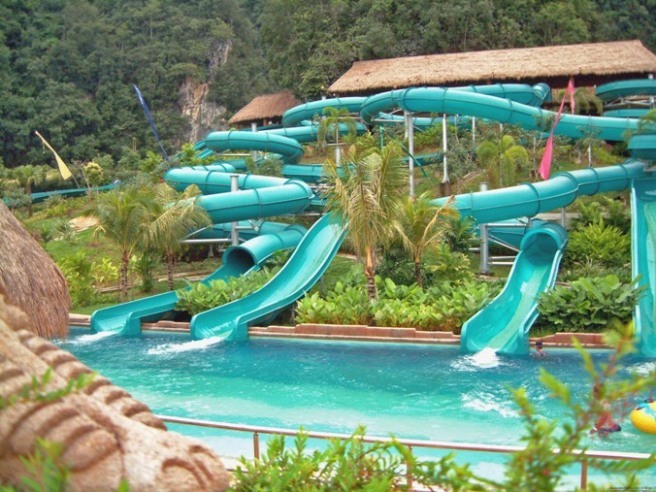 The thrilling slides that are set in the dense ancient rainforest is definitely a unique way to start your adventure for the day. Head into the wave pull which is Malaysia’s largest wave pool and enjoy being hit hard by the great waves that come upon you. The pool is definitely for those looking for some adventure. The Musical Body Wash showers are nearby and are a must-try to see for yourself what happens when you take a shower at this particular shower pool. If you are looking for extreme rides in the water, head on over to the Cliff Race to enjoy maximum speed that takes you shooting through a canopy slide; perfect to get your adrenaline pumping! Thread down the Adventure River which is a relaxing water ride that allows you finally sit back and drift lazily along the man-made river which features “ancient” structures along the way. The ride does throw in a few waves along the way. Also a good place; especially for the younger ones who should not be exposed to too much of the adrenaline pumping rides, the Lost World Petting Zoo is a great place to visit. Housing over 4,000 animals, the petting zoo is definitely a great place for children. The Raccoon Feeding show in particular daily at noon is one show that has made the day of many young at heart. Be mesmerized as you walk through the Rock Canopy and stop and listen to the birds at the Bird Paradise and enjoy yourself at the Rabbit Wonderland. Wherever you are, the Lost World of Tambun will make you lose track of time as you enjoy yourself discovering the hidden treasures of this exciting destination. The perfect place for seeking true island escape, with just a short ferry ride from Lumut. A gateway to all the city attractions with diversified of accommodation options available to choose from. A heritage town rich in tin mining history and serene atmosphere.